This week has been a struggling gallery-visiting week for me. While I very much looked forward to see the De Bruychere show at Hauser & Wirth and took much effort embarking on two laborious trips; since there does not seem to be any efficient and quick way to get from the upper West side (where I work) to the upper East side, then twice I was turned down by the seemingly temporary paper type-written note about how the gallery is under unexpected construction hence it is closed to the public. No luck uptown, and why not downtown. So... downtown it is, stealing my title from a 1960s Jean-Luc Godard film, both appropriate for its time period as well as its opposite qualities, I have decided to write about two shows what are in ways similar yet also quite different from each other. To continue my obsession with photographing in front of mirrors as recorded in my last posting, these Robert Barry mirror pieces seem right up my alley. Since in the 60s Barry has maintained his Minimalist approach working with text and geometry in the pure sense (i.e. in absence of color with a strong emphasis on rigid forms). Looking at the recent mirror pieces, they constrict strikingly within the aesthetic realm of the quintessential Minimalist art. Starting with the most obvious, they are perfect squares and circles with a pure rigidity that do not seem to give away to any sensual movements. Another strong element in Minimalist art is that they are highly conceptual with minimal to almost no traces of humanistic tactility. What I enjoy about Barry's work here is that the pieces are reflective in various ways, one being the physical reflection of the viewer and the other involves the viewer's thoughtful reflection. This kind of play with words and double meaning always intrigues me. Here you get a closer look and are able to read the text component of the piece. 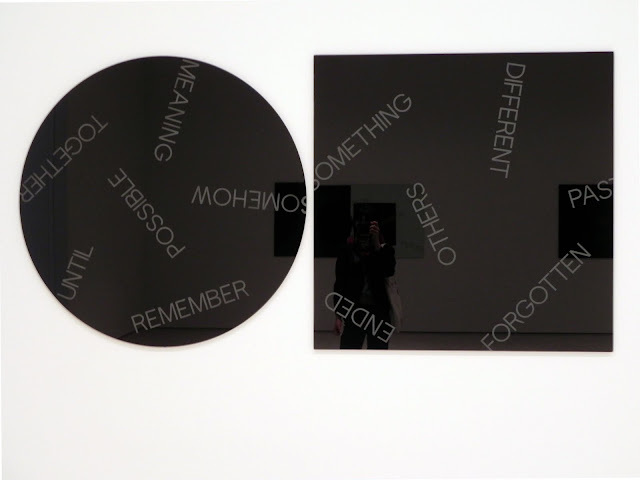 With the use of words, the reflection steers to a more intellectual direction of trying to make connections of what might the artist's intention be. It is certain that this is not to be a pure self-reflection or a self-critique as the words are floating within the visual plains inevitably influencing the "open interpretation" as mirrors often tend to suggest. To digress away from pure forms, there is also a sense of work in the process of being made if we count the spectatorship aspect of the work as its whole. Now, moving onto feminine and also a little bit inspired by my love of looking at colors (as I mentioned before in this blog), here is Contraband by Lynda Benglis also someone who has been active in the 60s right around the same time as Robert Barry. Perhaps it is cheating a little bit by comparing this piece which she made in 1969 to Barry's more recent pieces, however there are still many relevant points to be mentioned. First when Benglis made these "pour" pieces (note, not the official name but the one I gave), she consciously wanted to make the distinction between her works and what was going on at the time. What mostly was going on in the art-world then was the strong reaction against the painterly gestures of Abstract Expressionism, and when the emotional and physical presence of the artist dominated the works. In other words, many artists acted in rebellion withdrew expressive marks and worked to reduce the human presence in their works. Also at the time, male artists dominated most of the art-world scene but only a few woman artists were publicly recognized. 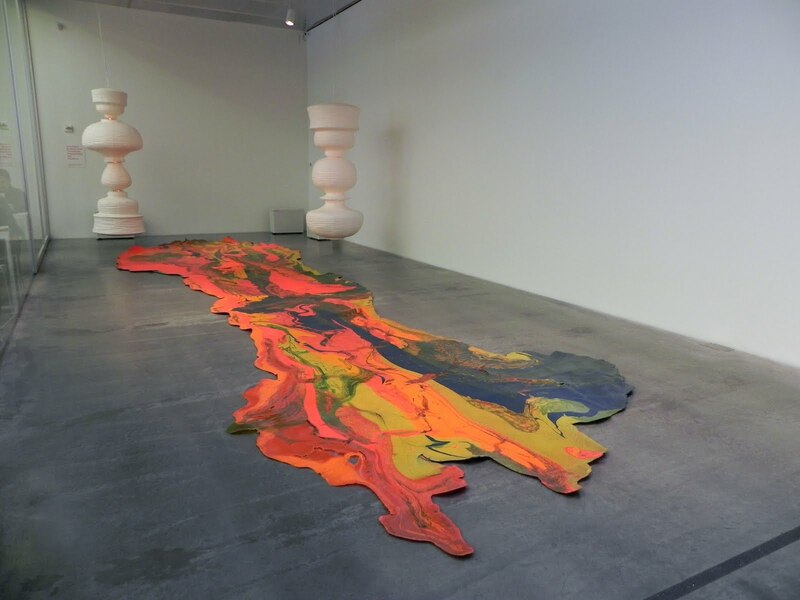 By pouring intense color pigments mixed with latex, Benglis emphasized on movement and the artists process in her work. Also very different from exhibiting pure geometry, her work is the antithesis of all the rigidity in using straight lines and sharp corners. The aspect I like most about her work, similar to the one shown below is that at the time when most art works were shown on the walls vertically, Benglis decided to work away from the convention of looking straight at or up. Instead, by making the work and showing on the floor gave a new position and perspective to looking at art. Here, to be fair are the more recent works made around the same time as the mirror pieces in 2009. 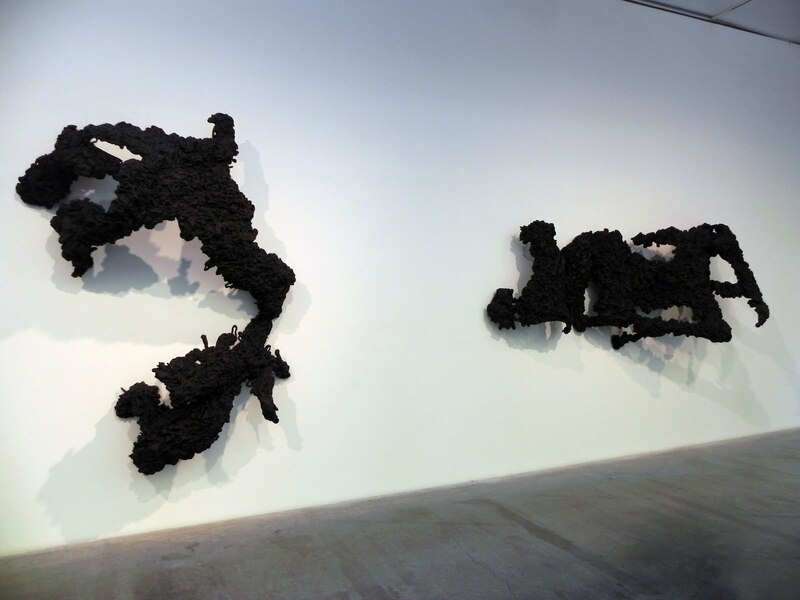 Even with the absence of color, Benglis manages to convey a human presence in these pieces. Perhaps the forms of the figures (as they are aptly named) do not bare or suggest human forms however by adding cast pieces on top of each other, the artist is again not afraid to show evidence of her process while at the same time seems to show a more sensual touch that gives a much less structured form in the end than the mirror pieces. With all the differences aside, I find both Barry and Benglis works equally poetic. One is the concrete poetics of form mixed with textual riddles, while the other is a fluid poetry of creation with a touch of rebellion. 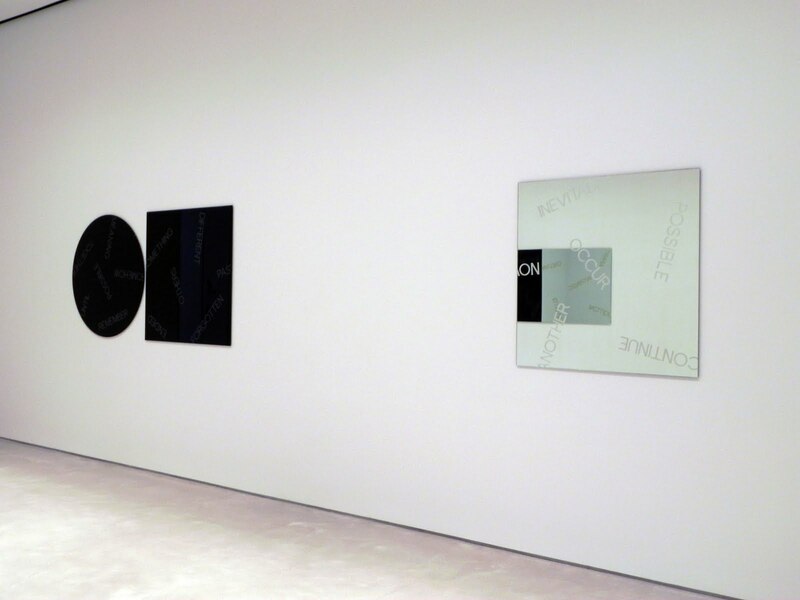 If you wish to see these works, Robert Barry Recent Mirrorpieces is currently up in Sperone Westwater until April 30. The Linda Benglis exhibition is up at the New Museum until June 19.